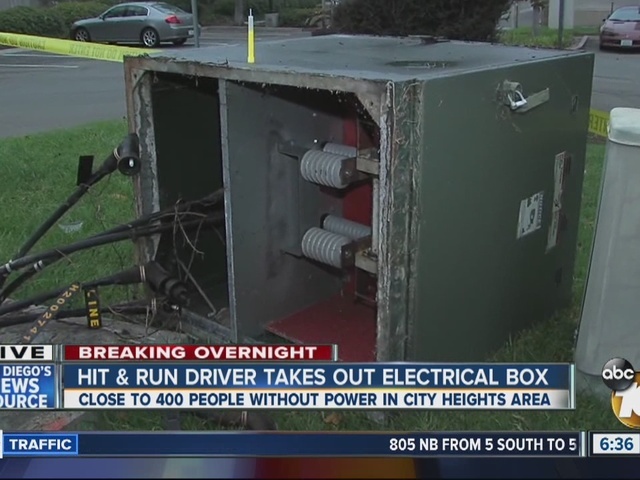 SAN DIEGO – Thousands residents in the City Heights area were without power early Tuesday morning after an SUV smashed into an electrical box and fled the scene. A witness told San Diego police that a grey-colored Dodge SUV crashed into the box at 47th Street and Federal Boulevard in the Ridgeview-Webster neighborhood at around 1:30 a.m. As responding San Diego police officers were examining the box, it exploded, but no one was hurt. Meanwhile, the witness followed the suspect vehicle, but eventually lost it, police said. At its height, 3,200 customers in City Heights, Chollas Creek and Oak Park were without power. As of 6:30 a.m., the number of customers without electricity was down to 389, according to SDG&E’s website. SDG&E crews working on repairs said it could take until noon to fully restore power. Police did not confirm if they had any leads on the suspect hit-and-run driver.